Hunter Travis Medlin was on his first ever deer hunt outside of his home state of North Carolina and was super excited to be hunting in what many people consider one of the premiere whitetail hunting hotspots in the country - Pike County, Illinois. 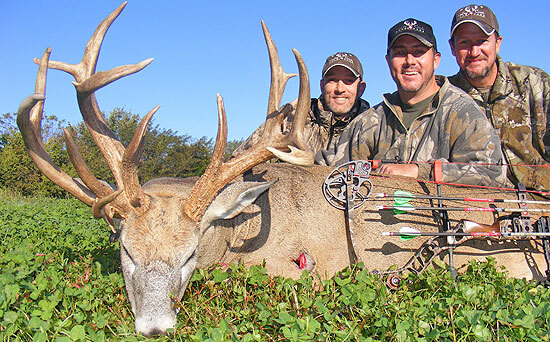 His hunting party (four friends) were set up with Hadley Creek Outfitters and the group had their pick of stands on two different farms. The plan was to hunt one location for their morning hunt and the other spot in the evening. With always a deck of cards on hand in a deer camp, the group decided to each draw a card and whoever had the highest would get the first pick of stand location. Travis won and wasted little time in getting ready for his hunt. Once in his stand, he spotted this fantastic buck sporting three main beams and was able to watch it for at least 30 minutes before drawing his Mathews Reezen 6.5 and sending a Rage 100-gr. broadhead right into the boiler room from 35 yards. "I hit him good. He ran about 40 yards behind me and crashed. It was definitely a hunt of a life time!" shared Travis. The buck green scored 208 7/8. Nice work Travis!